IDT Launches ClockMatrix Family of Timing Devices to Accelerate Wireless Carriers' 5G Network Migration | Integrated Device Technology, Inc.
SAN JOSE, Calif., March 26, 2019 /PRNewswire/ -- Integrated Device Technology, Inc. (IDT) (NASDAQ: IDTI), is helping wireless carriers migrate to 5G networks with today's launch of its new IDT® ClockMatrix™ family of multi-channel clocking devices. The family delivers best-in-class timing performance that exceeds the unprecedented 5G requirements for time precision while only requiring minimal changes to existing equipment designs. These devices are already used in 5G base stations, routers, switches and other networking equipment. 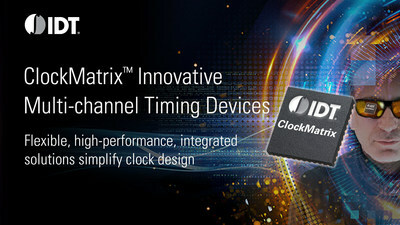 The superior performance of ClockMatrix devices makes them ideal for a broad range of networking, broadcast video, optical transport network (OTN) and industrial automation systems that require critical timing performance for clock generation, frequency translation, jitter attenuation and phase alignment.